: The ASTM- G175 test investigates the ignition sensitivity of oxygen components to a promoted ignition impact. 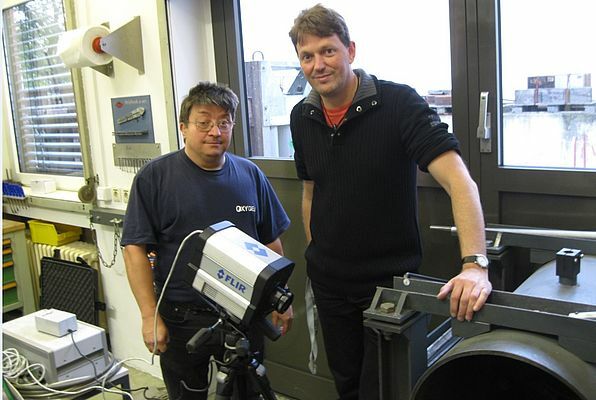 A new application from FLIR Systems details how the Safe Oxygen Working Group at the Federal Institute for Materials Research & Testing (BAM), Berlin, Germany are using a FLIR SC-Series thermal imaging camera to test the reaction of different materials and component designs to oxygen at varying pressures and temperatures. Pressurized oxygen is widely used in chemical plants, iron ore smelting, hospitals and for scuba diving. However the susceptibility of certain materials and component designs to large quantities of pressurised oxygen is highly unpredictable and can lead to strong reactions resulting in catastrophic failures. Traditionally BAM had used thermocouple sensors and spot pyrometers to measure temperature. However these methods had limitations, thermocouples can be easily destroyed if there is a strong reaction with oxygen and spot pyrometers measure only temperature at one location. After invested in a FLIR SC Series thermal imaging camera - BAM researchers have been able to perform non contact temperature measurements using an 'oxygen pressure shock test' methodology. In oxygen pressure shock testing the test material is finely divided to small flakes or grains, put into a stainless-steel container and exposed to the pressurized oxygen. 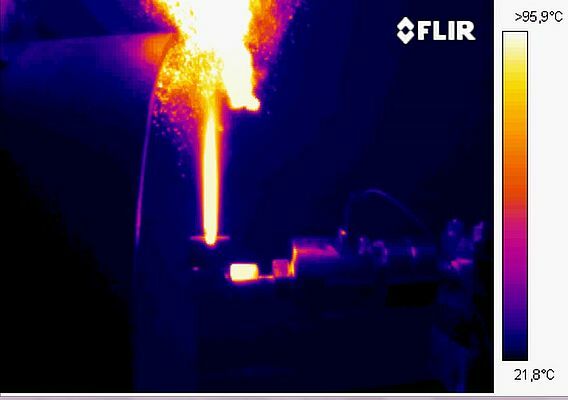 The FLIR SC-Series thermal imaging camera is used to detect the temperature rise on the outer surface of the container. Using the FLIR thermal imaging camera it is possible to detect a temperature rise which involves a chemical reaction of the material with oxygen. Performing these tests at different starting temperatures and at different oxygen pressures, potential reaction thresholds can now be accurately determined by researchers at BAM. The FLIR SC Series thermal imaging camera used at BAM contains an Indium Antimonide (InSb) Focal Plane Array (FPA) detector providing thermal images at a resolution of 320x240 pixels and a sensitivity of 13mK (0.013 °C). This research grade camera is capable of capturing high contrast thermal images at a frame rate of 432 Hz. For BAM oxygen pressure shock testing requirements, the FLIR SC Series camera was calibrated to accurately measure temperatures as high as 1,800 °C. With its wide temperature range, excellent thermal sensitivity, fast framing capability and user friendly analysis software the FLIR SC Series thermal imaging camera has proven itself is a perfect tool for these safety tests and fulfills all demands of BAM. The FLIR ETS320 is an affordable solution for reducing test times and improving product design for electronic board and device evaluation. Whether the goal is R&D or product testing, heat can be an important indicator of how the system is functioning. The ETS320 helps engineers and test technicians collect accurate, reliable data in seconds and analyze it quickly.